Averaging over 25 disposals so far this season, 2017 Jim Sullivan Medallist Liam Hunt will be playing his 50th VFL game this weekend against Frankston in the inaugural BeyondBlue round. Those selected in the team will be looking to be up and about to get a win on the board for Hunt’s 50th. Coburg fans will be happy to see that skipper Tom Goodwin is back, after spending a week on the sidelines due to a suspension, while Adam Swierzbiolek retains his spot after a successful debut against Williamstown last week. Harry Nolan, Mark Orr and Jay O’Donoghue (23rd man) have continued to show improvements week by week, and have all been included in the senior squad. Josh Weightman and Tyson Lever have also managed to keep their spots in the side, as they hope to prove themselves as consistent faces amongst the senior VFL squad. 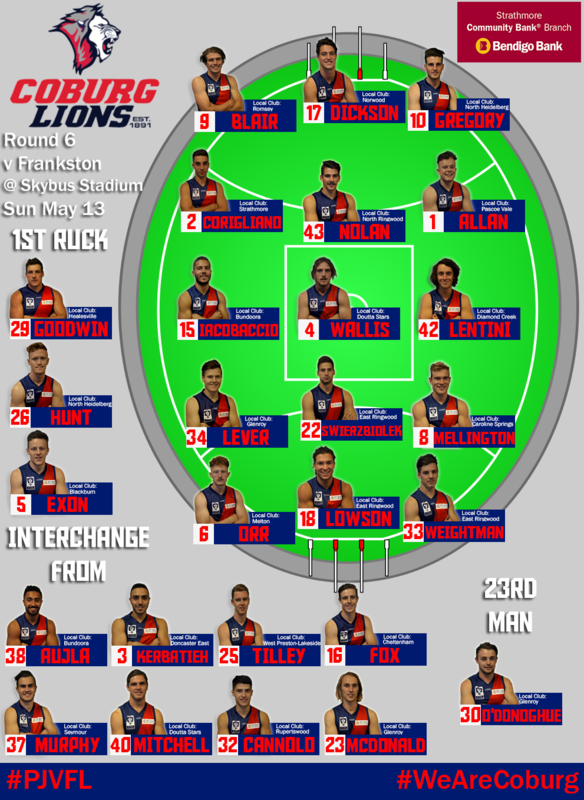 Ryan Exon will make a return from injury, while Marcus Lentini will look to keep in form after averaging 22 possessions a game so far this season. Hisham Kerbatieh, Damon Aujla, Jackson McDonald, Billy Cannolo, Jack Murphy, Josh Fox, Aidan Tilley and Lachy Mitchell have all been named on the extended bench, looming as possible interchanges. For the full team ahead of BeyondBlue round, check out the graphic below! We are Coburg, and we are proud to be partnering with AFL Victoria and BeyondBlue this weekend to hopefully start conversations, reduce stigma and increase support-seeking for anxiety, depression and suicide prevention. If you feel affected, please call 1300 22 4636 (24 hours a day, seven days a week) or visit www.beyondblue.org.au/get-support.